Black Friday, which falls on November 23 this year, can undoubtedly bring you the biggest revenue you’ve had in the entirety of 2018. And if you’re not overloaded with your November holidays marketing projects (e.g., Movember, Thanksgiving, Cyber Monday), I highly recommend you check your inventory, back up your servers, and create a great email campaign for Black Friday. That’s why I’m going to give you a few tips on how to design your Black Friday emails. You already know how important building your email list is. So, just imagine how this importance grows before the sales’ biggest day of the year. If you’re unsatisfied with the number of subscribers you have (and, let’s face it – it feels like there are almost never too many), you should start expanding your list ASAP. And, speaking of “ASAP”, before Black Friday, your signup forms should ooze with urgency. Or, suspense. You can tease the fact that something big is coming, and every subscriber will know about it first. Change the copy so that it highlights the benefits your future customers can get if they sign up today. 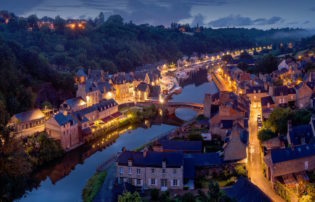 You can put up banners, create designated landing pages – the goal is to get people excited for what’s coming, and ready for your special offer emails in their inboxes. But, remember that a smaller list full of engaged subscribers is a million times more valuable than a list of people that ignore your emails. So, just be careful when building your list and make a good, not a never-ending, one. You’d think that Black Friday’s craziness is an opportunity to not really put a lot of effort into the design of your email. You’d think that all you need is a straightforward subject line, a big CTA and an enormous “-100% OFF” in the middle. Well, that’s not exactly true. Yes, it’s possible for a poorly designed email with a GREAT offer inside to attract customers. But, the week before Black Friday, your audience’s inboxes get flooded with offers that are probably just as good as yours. That’s why you should stand out the most during the holiday season. And here’s how. When it comes to subject lines on Black Friday, you can either use keywords like “free” or “discount”, use some numbers (e.g., “80%”), or just play on your subscribers’ feeling of anticipation. Write a catchy line connected to your brand. Take Casper, a mattress brand, for example. 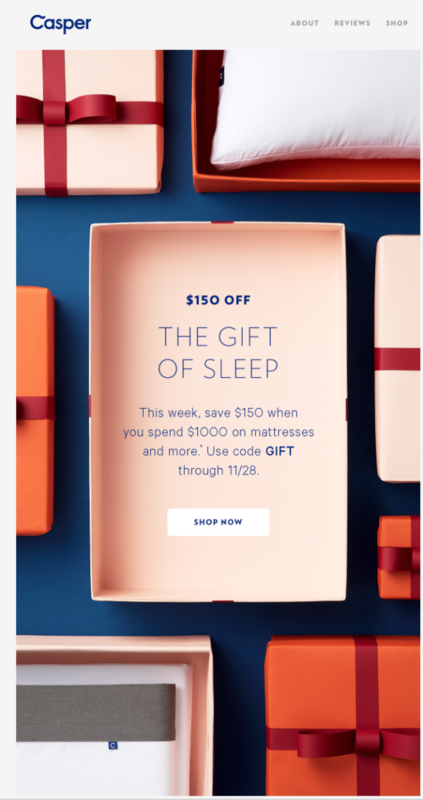 Their Black Friday emails’ subject lines were: ‘’This Black Friday, choose snooze.” and “Every Friday is Black Friday when your eyes are closed. Because you’re napping.” Funny, lighthearted, and referring to the products – you can’t go wrong with that. Consider using emojis to make your email’s subject line pop. For good subject line and preheader examples, check out our 2018 Holiday Campaigns Guide. A simple rule is not to overdo it. A few excitement-inducing lines will definitely be enough. Also, if you think of using multiple CTAs – make sure all of them are really necessary, visible, and not too flashy when next to each other. In the emails you plan to send long before Black Friday, inform your customers about what kind of deals they can expect. Be careful, though. Plant a seed, give a hint, but don’t spoil the fun and don’t write about all the details yet. When the time for the more salesy and “shop now” emails comes, create a sense of urgency by setting a deadline. Stating that the deal ends on Cyber Monday, or that the promo code can be used through 11/24, will give your customers a little push to shop. A common theme in Black Friday campaigns is “all black everything” – and that’s pretty self-explanatory. But, when thinking of the overall design and color scheme, remember to stay true to your brand identity. 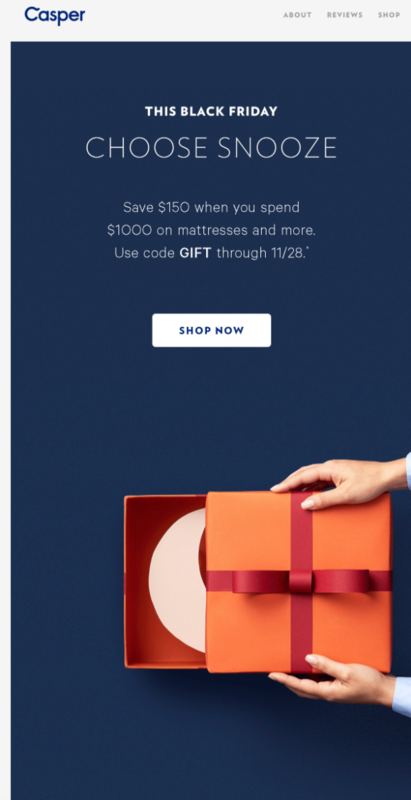 The color palette in their Black Friday emails is not only soothing, which is appropriate for a brand that sells mattresses, but also uniform across all their platforms and channels. Also, these emails are very simple – a catchy header, clear information on what deal you can get and when, and a single CTA. There’s no clutter, no flashy content, and no unnecessary copy. When an email gets straight to the point, the customer is more likely to follow your instructions without getting overwhelmed. A great idea is to incorporate GIFs into your Black Friday emails. GIFs catch the eye, and when they show the process of unboxing or unwrapping, they build up anticipation and excitation. Also, as Nike only dropped a few products in their special-edition collection, it’s justified that they added a different CTA underneath each of them. The customer can be taken directly to the product they like, and buy it faster, as the inventory is limited. And again, the copy in these emails is as brief and condensed as it can be – there’s no time for reading when there are thousands of people already rushing to the checkout ;). 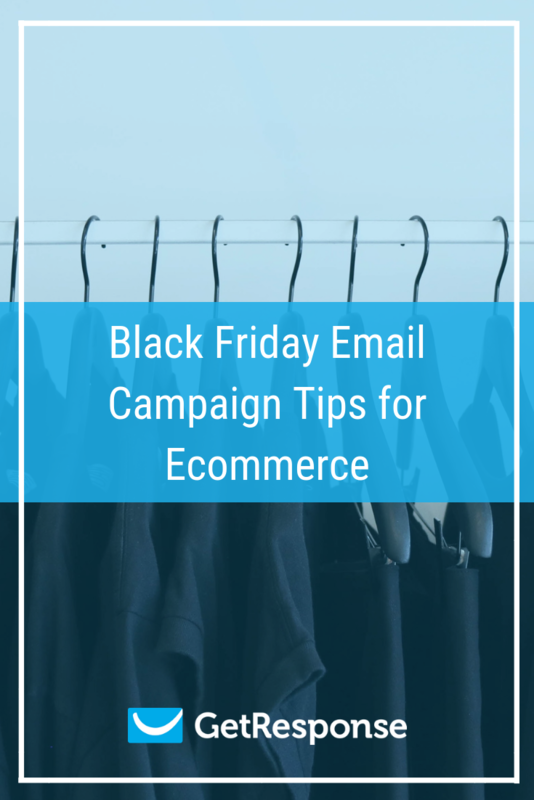 When in doubt, you can build your Black Friday email using our templates! You could be starting your campaign any time now. Some people recommend starting a week before, or last minute – on Black Friday. Whichever option you chose, it’s best to do a little strategizing and creating automated workflows beforehand. First, try segmenting your audience into as many segments as you need. Then, you can personalize the emails and offers accordingly. Re-engage the disinterested subscribers, and rekindle your relationship just in time for the Big Day. Then, consider giving your subscribers scoring points so you can deliver different offers based on their engagement. Also, if you want to send a sequence of emails with different products and deals, remember to tag people that already converted, so you can stop nagging them, and send a thank-you email instead. Prepare some cart abandonment emails that will remind your customers to come back and check out. Offer them help and see if they convert. If they don’t, you can set another reminder with a special deal, like free shipping. You can also turn your early bird sale into a game! How? You’ll find the answer in our guide: 8 Marketing Automation Workflows for Your Holiday Campaigns. If everything goes right and the customer converts, make sure to thank them for their purchase and give them a chance to rate their experience or send them a satisfaction survey. Remember to back up your servers – your website failing to perform when hundreds of people click “buy now” at the same time will cost you customers not only on Black Friday but in the long run too. Check your inventory, so your stock is full and magazines ready to be emptied. 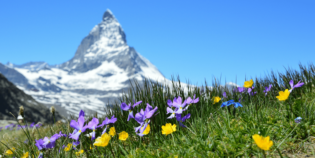 It’s better to overestimate than underestimate, leaving your customers empty-handed. You can also run an extended sale that lasts until Cyber Monday – another holiday perfect for ecommerce shops worth celebrating. Make the experience as seamless as possible, and enjoyable for both you and your customer. And, automate your workflows, so on the Friday after Thanksgiving, you can sit back and enjoy the holiday too. Some great deals in other shops are waiting for you on Black Friday, after all. Happy selling and happy shopping! See you in my inbox on November 23!